The Aries PC/104-Plus single board computer from Diamond Systems uses the Intel “Bay Trail” E3800 series processor to deliver an unmatched combination of performance, price and power consumption. Packed with real-world features, Aries provides a complete solution for most embedded applications in a single board, saving you space, time, and money. Aries goes beyond the standard processor and I/O features found on other Bay Trail SBCs to provide rugged performance along with a professional-quality data acquisition circuit supported by industry-leading software. The full rectangular shape of Aries provides more PCB area and coastline to support the extreme level of I/O offered by the board. 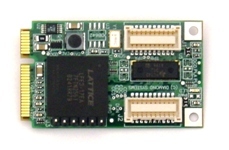 The LVDS connection is dual channel 24-bit. The maximum resolution of VGA, LVDS and DisplayPort is 2560 x 1600. The HDMI maximum resolution is 1920 x 1080. Backlight power and control are provided on board. LCD power is jumper selectable between 3.3V and 5V, and backlight power is jumper selectable between 5V and 12V. If needed, 12V must be provided by the system power supply and is routed through the board from the input power connector to the backlight connector. Aries provides both a PC/104-Plus expansion socket and a combination PCIe MiniCard / mSATA module socket. The combination socket auto-selects for either PCIe or mSATA depending on the type of module installed. Aries supports Diamond’s complete line of PCIe MiniCards. 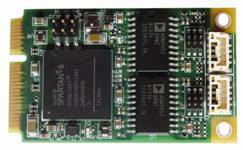 The SBC also supports the installation of a SATA disk-on-module with a mounting hole for increased ruggedness. A jumper provides power directly to the module through the single SATA connector; no separate power cable is required. Both the SATA DOM and PCIe MiniCard sockets can be used simultaneously, affording a highly compact and feature-rich embedded computing solution only one "board" high. Four standard models are available depending on your need for performance and data acquisition. Other configurations are available by special order with a minimum order quantity. Aries Development Kits, DK-ARS-LNX or DK-ARS-WE7, are available with all the components you need to get started on your embedded design. Each kit contains an Aries SBC with 1.91GHz E3845 CPU, 4GB DRAM, integrated data acquisition, 32GB MLC SATA DOM flashdisk with bootable operating system, cable kit (CK-ARS-03), and Quick Start Guide. The Aries cable kit, CK-ARS-03, includes cables for all I/O connectors except LCD, HDMI, and DisplayPort. Aries incorporates a perfect combination of highly advanced I/O features, including 3 USB 2.0 ports and 1 USB 3.0 port, 4 programmable RS-232/422/485 ports, 2 10/100/1000Mbps Ethernet ports, and 2 SATA ports. A multi-use MiniCard socket auto-selects for either a PCIe MiniCard or mSATA flashdisk. This dual function socket can be used to add compact additional I/O or mass storage to your system. 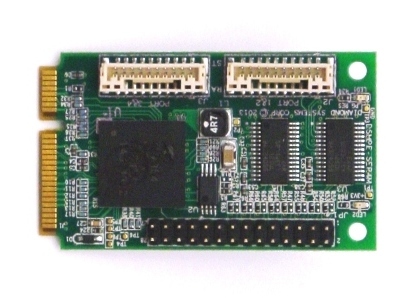 The dedicated SATA connector can be used with off-board SATA devices and also supports use of a board-mounted miniature SATA disk-on-module for a smaller overall system envelope with less cables. Aries provides 4 RS-232/422/485 ports using multiprotocol transceivers, one per port. All configuration features are fully programmable as well as configurable in the BIOS screens, including protocol and line termination for RS-422/485. In RS-422 mode, both half duplex and full duplex line termination can be selected. Aries supports two 10/100/1000 high speed Gigabit Ethernet ports derived from Intel I210IT PCIe Gigabit Ethernet controllers. A latching connector is used to bring these ports off board instead of RJ-45 jacks, optimizing space on the board and increasing ruggedness. Activity status of the Ethernet ports can be read from LEDs. Aries includes miniature rugged latching connectors for most I/O, including LVDS LCD, as shown in the photo below. Latching connectors improve the ruggedness of the SBC, enhancing Aries' performance in harsh environments. Aries is designed and built with industrial range temperature components and wide temperature design considerations. The board has been tested and qualified for use in temperatures ranging from -40°C to +85°C. All models feature wide temperature operation off the shelf with no pre-screening required. A thicker PCB of 2.4mm (shown above) increases rigidity and enhances long-term reliability. All I/O connectors, except HDMI, DisplayPort, and USB 3.0, provide positive locking connections for confident performance in vehicle or other high vibration environments. Aries is compatible with MIL-STD-202-G shock and vibration test requirements. The system memory is soldered on board for increased ruggedness, eliminating potential failures often associated with SO-DIMM sockets and improving high temperature reliability. For custom configurations, all jumpers can be replaced with 0 ohm resistors soldered into dedicated locations on the board. In addition, the number of jumpers has been reduced by offering software configuration of all serial port features. Aries can operate over the full industrial temperature range of -40°C to +85°C without a fan, due to its use of an integrated bottom-mounted heat spreader for effective cooling. The heat spreader contacts the bottom-mounted processor, memory, and other key heat producing components and provides efficient heat transfer from these ICs to the mounting surface (enclosure wall). A traditional 0.5" high heat sink accessory is available for applications that require a non-contact installation method. Aries is available with a complete analog and digital data acquisition (DAQ) circuit integrated onto the board. The features of the Aries DAQ circuit surpass those found on most other embedded SBCs to provide a comprehensive, professional quality subsystem backed with top of the line software support. "A" models include the full DAQ circuit with both analog and digital I/O features, while "N" models include only the digital I/O features. The A/D circuit includes 16 single-ended / 8 differential analog input channels with programmable input ranges and a maximum aggregate sampling rate of 250KHz. A built-in programmable counter/timer supports accurate high-speed sampling with precise timing. The 2048-sample FIFO with programmable threshold ensures error-free sampling and enables you to tune the performance of the circuit to minimize interrupt processing overhead. The D/A circuit consists of 4 16-bit D/A voltage outputs with independently programmable output ranges including 0-10V, +/-10V, 0-5V, and +/-5V. A 2048-sample waveform buffer is included to support arbitrary waveform generator functions on up to 4 channels simultaneously. The digital I/O circuit consists of GPIO, counter/timers, and pulse-width modulators. The GPIO circuit provides 22 buffered digital I/O lines, consisting of one 8-bit port and 14 1-bit ports. Each port is individually programmable for input or output. The 1-bit direction controllable ports provide better matching of input and output quantities to each application. Jumper configuration enables selection of 5V/3.3V logic levels and pull-up or pull-down resistors on the digital I/O lines. The 8 32-bit programmable counter/timers feature both up and down counting with clocking selectable from an external digital signal or the on-board 50MHz clock. Counters can be used for generating programmable output frequencies with programmable output pulse widths, counting external events, generating interrupts to the host processor at a programmable rate, and driving A/D sampling at precise frequencies with perfect timing between samples. The circuit further includes 4 24-bit programmable pulse width modulators also driven by the on-board 50MHz clock. These feature programmable rate, duty cycle, and polarity, with real-time rate and duty cycle update capability. Diamond System' Universal Driver software provides unmatched power and flexibility for embedded data acquisition programming with PC/104 and small form factor I/O boards. It provides flexible C-language programming support for Windows and Linux to control all data acquisition features on Aries, as well as Diamond's PC/104 and PCIe MiniCard data acquisition modules that can be used with Aries. A powerful and convenient graphical control panel provides instant, easy access to all data acquisition features on the board. It can be used for proof of concept, testing, and even system debugging. 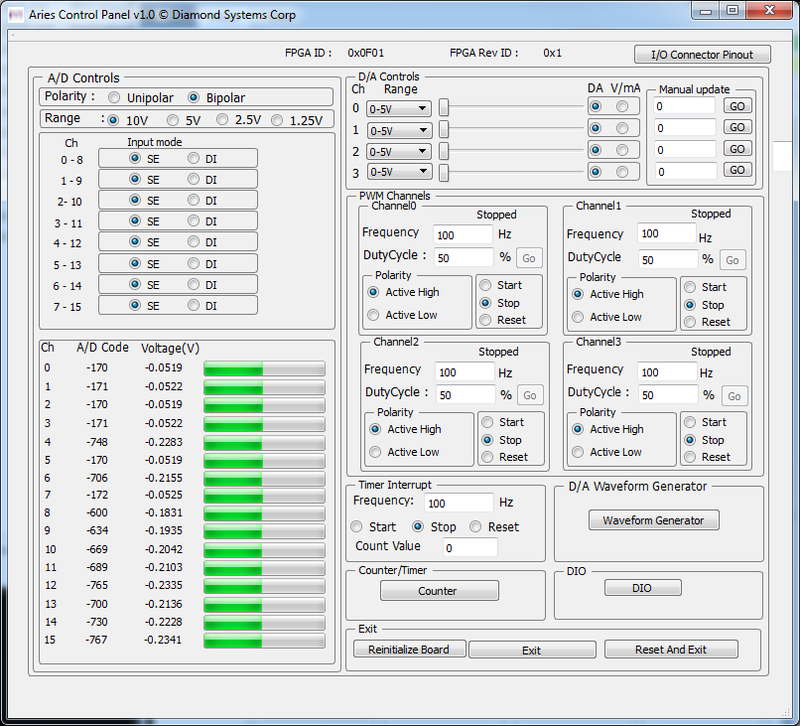 Click on the following link to download Diamond System' Universal Driver software for the Aries SBC.